Todd Gongwer is a Husband, Father, Entrepreneur, former college Coach and aspiring janitor who is passionate about helping others discover their purpose in leadership and in life! His expertise in the area of leadership and team dynamics come from over twenty-five years of a wide range of experiences spanning the world of business and athletics. He’s held senior positions in companies ranging from entrepreneurial start-up to public entity while also serving as an assistant college basketball coach for one of the winningest small College programs in the country during the 1990’s. Since writing Lead…for God’s Sake! 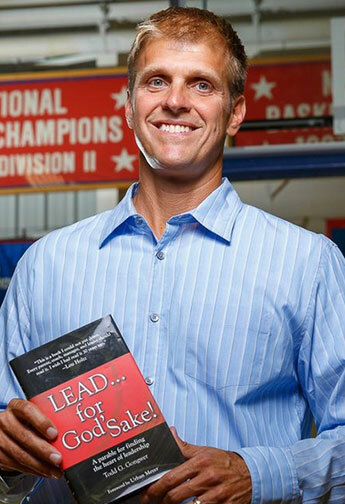 Todd speaks, teaches, and coaches on the subject of leadership throughout the nation. The impact of his message has been featured in numerous publications such as ESPN the Magazine, ESPN.com, YahooSports.com, and Grantland.com. In addition, his powerful messages are impacting leaders from Fortune 500 companies, small businesses, major universities, professional sports teams, school districts, and churches throughout the country. Referred to by many as a Coach of coaches, Todd also works as a confidant and counselor to some of the most successful coaches and business leaders in the US. Wrote and published (through Kardia House), LEAD…for God’s Sake! "… it became more and more apparent, this was not a story I created in my head; rather, this was a story God was pouring out through my heart." If you are interested in having me speak at your event, please check out my Speaking page. Contains print-ready photo, biography, and contact information. © 2019 LEAD...for God’s Sake!